With motorists in London braced for the launch of congestion charging, BBC News Online's Bill Wilson looks at how the scheme in Durham City is faring. 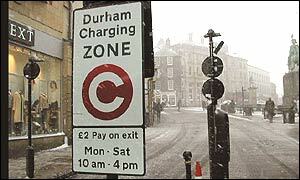 As London prepares for the introduction of congestion charging on 17 February, all eyes are on Durham City, where the first UK toll road in 100 years was introduced on 1 October, 2002. Since then drivers have been charged £2 to enter a small part of the city centre between 10am and 4pm, Monday to Saturday. The affected area stretches from the entrance to the Market Place, up along the historic, narrow Saddler Street, to the Durham Cathedral peninsular. A ticket machine is linked to an automatic barrier in the carriageway, which lowers when drivers pay to leave the charging zone. The system is monitored by security cameras and drivers caught dodging the charge are liable for a fine of up to £30. County council officials had hoped to see a drop in traffic of 50%, but the result has been even more dramatic. Traffic levels within the zone during charging hours have fallen from 2,000 to 200 vehicles a day - a drop of 90%. Before the system was introduced, motorists and pedestrians were in competition for space in Saddler Street. Now there is an almost European, pedestrianised, feel to the old city area, with shoppers walking casually in the single-carriage roadway alongside the occasional vehicle. County council leader Ken Manton said the environment had benefited, and that the roads were now safer. "We are extremely pleased with the way it has gone," he said. "We have sent a letter to Ken Livingstone asking him to come and see the scheme but no-one has appeared so far. I think they are missing something by not coming. "I wonder if there is a cosmopolitan arrogance with regard to our scheme, but we have never said it was on the same scale as London. "This is a model that can be used on a small scale for historic places such as Durham, or large scale for cities like London." Mr Manton said lessons which could be learned from the Durham scheme included the importance of providing stewards in the early months to ensure people were able to use the system. "It is also useful to see how traders are learning to readjust their delivery hours and methods, and to see how the people who live and work in the zone are readjusting." However there is criticism of Durham's scheme, particularly from small independent traders angry at having to pay £2 every time they take a delivery to their shops during the charging hours. They also claim that, paradoxically, there are now less casual pedestrian visitors than when there were more cars in the zone. Peter Jackson, who runs Mugwumps gift shop and is chairman of the local chamber of trade, said: "I think the city has been used as a guinea pig for London, in return for government cash to enhance park-and-ride schemes here in Durham. "It has cut down the vehicles, although I don't believe the reduction is as great as the county council says. "The real problem for business is that if I want to unload from a van it costs me £2 a time. I have at least 500 deliveries a year, which means £1,000 in charges a year. "That means I have to create a lot of extra turnover a year just to pay these charges. Something has to be done to help small businesses." The council has also found itself with a funding shortfall, as it had hoped more cash would be raised from the toll. That money was to have funded the Shopmobility scheme for the disabled and cash has now been found from other council sources. However the City of Durham Civic Trust is supporting the scheme. Its chairman Roger Cornwell said: "Pedestrians have been given a chance to reclaim the street. "Having just one barrier may seem a rather low-tech solution, but it appears to be working. "There is a reduction in the number of people who would drive in just to use a cash point, or to drop someone off and then come back five minutes later to pick them up." And local resident Henry Martin Taylor said: "It is a definite improvement, with more pedestrians and less traffic. I am all for it."